If you've never checked out the craft blog Whipup.net then you should. About Whip Up - Whip Up is a multi-author site. It has contributors from around the world who all share a passion for making things and beautiful design. The editor is Kathreen Ricketson, and she wanted to create a central meeting place for ideas and projects and technical advice for all the latest that is handmade around the world. Whip Up have done a great little review on one of our books Made From Scratch. Starting off as a young, single woman with a desk job and a city apartment, Jenna Woginrich set out to build a more self-sufficient lifestyle by learning homesteading skills. She didn't own land or have much practical experience beyond a few forays into knitting and soap making, but she did have a strong desire to opt out of what she saw as a consumer-driven culture. After moving across the country to a rented farmhouse in northern Idaho, she learned to raise chickens, keep bees, and grow her own food...This is the story of her joyful, dramatic, and sometimes sorrowful journey toward self-reliance. Along the way, she learned that an abundance of enthusiasm and a willingness to experiment could make up for a lack of knowledge, and that reaching out to others for mentoring and guidance could help her reconnect with her community. Jenna has her own blog Cold Antler Farm, where she shares stories and images from her days living the Made From Scratch life. 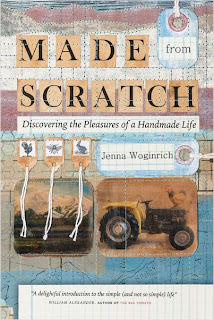 Anyone interested in shedding their consumer selves and taking the leap into a handmade life should read this book. So, I'm giving away a copy! All you have to do is leave a comment here by Sunday 27th September to go into the draw. Tell your friends, tell your family, anyone you think would be interested in winning a copy. And feel free to post a link back to this post on your own blog if you have one! This sounds awesome! Being a mum with a 6mth baby at home and currently having been recently forced back into the workforce (to pay the bills and just 'live'), i think its great to be able to learn how to become self sufficient. A lot of modern people dont' get to learn stuff from their mums, aunties and families as they don't live close (mine are in other state) so this sort of book looks like it could help with those life skills that are missing. Its inspirational and i can't wait to give it a read. It sounds like a great book. I'd love to have the guts to do it, but I just don't like chickens! Love eating them, but the real creature!? No thanks! Small problem you see! I'll stick with cooking from scratch and my sewing (slowly) forays!!! Thanks for the blog link too. Off to check that out. This sounds like a wonderful story. I would love to win it! Thanks for the opportunity! I love to read this book as I agree with N Wrath so many are not able to learn from previous generations anymore so this sounds like an interesting read in figuring out how to do it ourselves. Please enter me into the draw, thanks! Hey! looks like a great giveaway!! I'm totally into the handmade thing- just need to get motivated to apply it to all areas of life!! I would live to have this! Thanks for the opportunity! I'm in! I love making things from scratch, but I do need a lot of help with it! I love handmade things! When you pick good quality materials, handmade items often outlast their store-bought counterparts. Handmade rocks! Enough said really.